In 1991-92, Vermont passed “community rating” and “guaranteed issue” laws for small group and individual health insurance. Over time, this drove out all but two carriers (MVP and BCBS). The government mandates combined with a loss of competition in the market caused health insurance premiums to skyrocket. In 2011, the legislature passed Act 48, which puts Vermont on the path to adopting a government-run, single payer healthcare system in 2017 ostensibly to control these rising costs and to expand coverage to the 7% of the population that didn’t have health insurance. Vermont would be the first state to adopt such a system. The foundation for Act 48 was a commissioned report by Dr. William Hsiao. The Hsiao Report claimed that Vermont could save $500 million in the first year if it adopted a single payer system. That promise has since been discarded. Act 48 established the Green Mountain Care Board, a five-member panel appointed by the governor with unprecedented power over doctors, hospitals, prices and benefits in both the public and private sectors. Board members are appointed by the governor to six-year terms – three times longer than any elected official, making them uniquely divorced from accountability to voters. Additionally, Act 48 established Vermont Health Connect (the Exchange) in accordance with the federal Affordable Care Act. However, the Vermont legislature did this in a way designed to maximize the amount of government subsides it could receive for single payer in 2017 (“The intent of the general assembly is to establish the Vermont health benefit exchange in a manner such that it may become the foundation for Green Mountain Care.” (Act 48)) Not to maximize benefit to the consumer. The two most significant issues to emerge from the passage of Act 48 so far are the disastrous rollout of Vermont Health Connect (After spending nearly $100 million on the website, and a year after it was supposed to be functional, it still doesn’t work), and the fact that the Shumlin Administration’s ongoing refusal to identify a funding plan for Green Mountain Care, despite Act 48’s legal requirement that they do so by January 2013. Vermonters currently pay a total of about $5.5 billion for healthcare, including public and private expenditures. Governor Shumlin promised he would “take our marbles and go home” (July 26, 2011) if total costs under GMC aren’t less than this. Single Payer really isn’t “single” payer. Vermont has no jurisdiction over federal healthcare plans such as Medicare, Tricare (military), Federal Employee Health Benefit Plans, or companies that self-insure under ERISA. This accounts for nearly half of Vermont’s population. The efficiencies promised by a single payer system cannot be accomplished. “It is the intent of the general assembly that Green Mountain Care provide a level of coverage that includes benefits that are actuarially equivalent to at least 87 percent of the full actuarial value of the covered health services.” (Act 48). This means that the consumer is responsible for 13% of the cost via co-pays, premiums, or some other measure. There is currently no plan for how this money will be collected. In order to maximize federal subsides for single payer in 2017, the legislature made it mandatory for individuals and small businesses with under 50 employees to participate in VHC. Businesses with more than 50 employees will be required to participate in 2016. Vermont is the only state with such mandates. The total federal grant for creating VHC is $168 million. Almost a full year and nearly $100 million spent, the VHC website still doesn’t work. There is no way for people to make changes to their policies on-line. 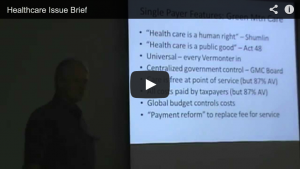 The promise of single payer is that government can deliver healthcare more efficiently and cheaply through one “spigot.” Two facts, 1) that one spigot is impossible given the number of federal health insurance programs that exist, as well as private health insurance for out of state patients, and 2) the high cost and complete lack of competency demonstrated in the roll out of Vermont Health Connect, indicate that a government run system will not be cheaper or more efficient than what we have now. It will likely be less efficient and more expensive, leaving people with fewer choices, and poorer healthcare.